With 86 percent of the state’s CCBs being beneficially used, Maryland is well above the national utilization rate of 45 percent, as reported by the American Coal Ash Association for 2014. PPRP has supported research and demonstration projects for more than 20 years regarding beneficial use of CCBs, particularly those applications that could use massive quantities of CCBs. A wide variety of bench-scale research projects and field-scale demonstration projects have been completed with significant focus being placed on uses of CCBs in underground mine reclamation, restoration of disturbed lands, and manufacturing. 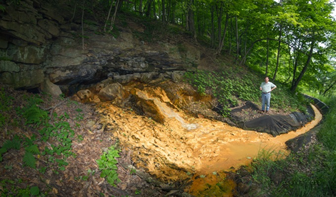 A long history of coal mining in Western Maryland has left a legacy of environmental challenges including acid mine drainage (AMD) as well as land subsidence as aging mine tunnels weaken and collapse. Through demonstration projects such as the Winding Ridge Project and the Kempton Man Shaft project, PPRP demonstrated the feasibility of injecting grouts made from 100% CCBs into underground mines to reduce acid-producing reactions and to help restore natural ground water flow patterns. Desktop research projects have characterized the broad extent of opportunities for such uses on a larger scale. PPRP sponsored a review of the Works Progress Administration (WPA) Maryland Mine Sealing Program of the 1930s that sought to mitigate AMD by sealing mine openings. The program was largely judged to be unsuccessful in mitigating AMD; however, the extent of the Mine Sealing Program and reasons for its failure to impact acid mine drainage were investigated as guidance for large-scale use of CCB grouts in mine applications. 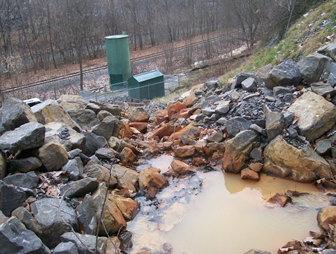 In addition, PPRP supported efforts of the Maryland Department of the Environment Abandoned Mine Lands Division (MDE AMLD) to address a mine blow out at the McDonald Mine that overwhelmed the doser treating its effluent (Figure 5-15). PPRP and MDE AMLD collaborated on investigations of how to bring the increased flow under control, manage the large volume of sediment being generated, and provide more effective treatment in the limited space available between the mine discharge and Georges Creek. Opportunities for CCB use in the form of grout and concrete were included in these investigations. PPRP further supported a benchtop weathering study of CCBs to demonstrate their stability in the presence of acidic waters typical of AMD.